Now, you can keyboard in the language of your choice! Covers are portable: They go to and from the classroom, office, library, home, and cybercafés! Now you can keyboard in the language of your choice on your home-language keyboard – no need swap keyboards. SpeedSkin’s computer keyboard covers for foreign languages are imprinted in the language of your choice, lay over the existing keyboard, and are entirely portable. Take them to and from the classroom, office, library, home, hotels, and cybercafés. Buy an English Upper/Lower Case, imprinted cover to take to foreign countries to use with keyboards set up with their country’s home-language layouts. Change the keyboard’s language to English in the computer’s operating system, place the cover, and type in English to family, colleagues, and friends. 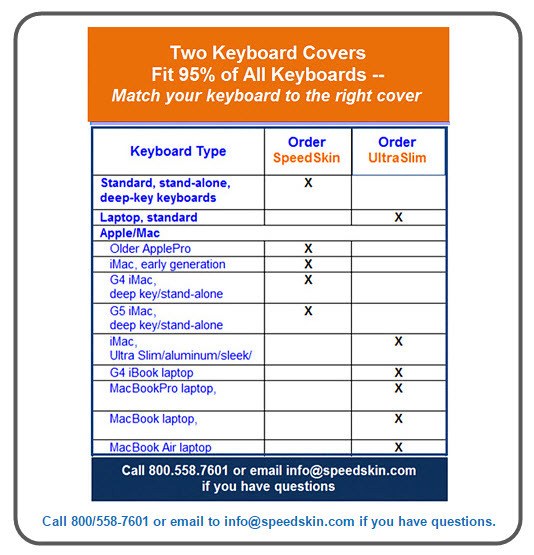 » SpeedSkin / Standard covers fit standard desktop/PC keyboards. » UltraSlim covers fit Chromebook; Mac; MacBook; G4 iBook; iMac; slim-line, stand-alone, desktop keyboards; and all standard laptop keyboards. Return to Home for ordering options / Shipping & Handling charges / Refund and Exchange policies. When you purchase a foreign language computer keyboard cover, your first step is to select your preferred language layout within your operating system. Detailed instructions for doing so are provided within the keyboard cover package. You then place the language cover over your keyboard and begin typing away! NOTE: The imprinted layout cover must match the depth of the underlying keyboard (PC or UltraSlim). SpeedSkin keyboard covers cover only the four rows of alpha, numeric, and punctuation keys. The function keys remain visible. They are made of incredibly flexible and touch-sensitive polyurethane and are allergy-free. They contain NO LATEX. These covers have been tested to one million impacts with no wear or tear to the imprinted lettering or the cover itself. All computer keyboard covers come with a plastic storage tray to use when traveling or to protect the cover when not in use. All language layouts are based on WinXP OS language layouts. Language selection and layouts can vary minimally based on the customer’s WinXP version. The list to the right is a list of available language layouts. For a complete list, please visit our Shop Now page for an alphabetical list of all available languages. To complete the layout, the following languages require an extension tab to the left of the 1/! key.